The U.S. Environmental Protection Agency approved a rule Feb. 8 banning all cruise ships and most other large oceangoing vessels from discharging treated sewage within 3 miles of California’s 1,624-mile coastline and surrounding islands. The new rule, signed by EPA’s Pacific Southwest Regional Administrator Jared Blumenfeld, applies to vessels larger than 300 tons, and it is expected to prevent the discharge of more than 22 million gallons of treated sewage generated by large vessels in California marine waters every year. “Not only will this rule help protect important marine species, it also benefits the fishing industry, marine habitats and the millions of residents and tourists who visit California beaches each year,” Blumenfeld said. Prior to the signing, multiple areas along California’s coast were off-limits to dumping, but the federal rule seals off the entire coast to sewage discharge. California is now the first state to apply a ban to its entire coastline. During a telephone press conference, Blumenfeld said that the Coast Guard will be primarily responsible for enforcing the rule, which gives weight to the 2005 California Clean Coast Act, sponsored by Sen. Joe Simitian (D-Palo Alto). Simitian’s Senate Bill 771, or the Clean Coast Act, prohibits all commercial ships from dumping hazardous waste, sewage sludge, oily bilge water, “graywater” from sinks and showers, and sewage in state waters. The bill required the state to petition the federal government for a “No Discharge Zone” to enforce the bill’s anti-dumping provisions. In 2006, California EPA officials asked the federal government to establish the new rule, leading to finalization of the rule six years later. “California’s coastal waters will no longer serve as a sewage pond for big ships,” said California EPA secretary Matthew Rodriquez. During the press conference, Blumenfeld said that he expects cruise ships to dump treated sewage outside of the 3-mile boundary from now on, prior to entering California waters, or coming to port. Most ports in California do not have pumpout stations for cruise ships at their docks, and Blumenfeld estimated that the fleet of ocean liners that traverse California’s coast may have to expand their sewage-holding capabilities to accommodate the new rule. The environmental group Friends of the Earth, which supported the ban, estimated that a typical large cruise ship generates an average of 210,000 gallons (or 10 backyard swimming pools) of human sewage and 1 million gallons (40 more swimming pools) of graywater (water from sinks, baths, showers, laundry and galleys) on a one-week voyage. 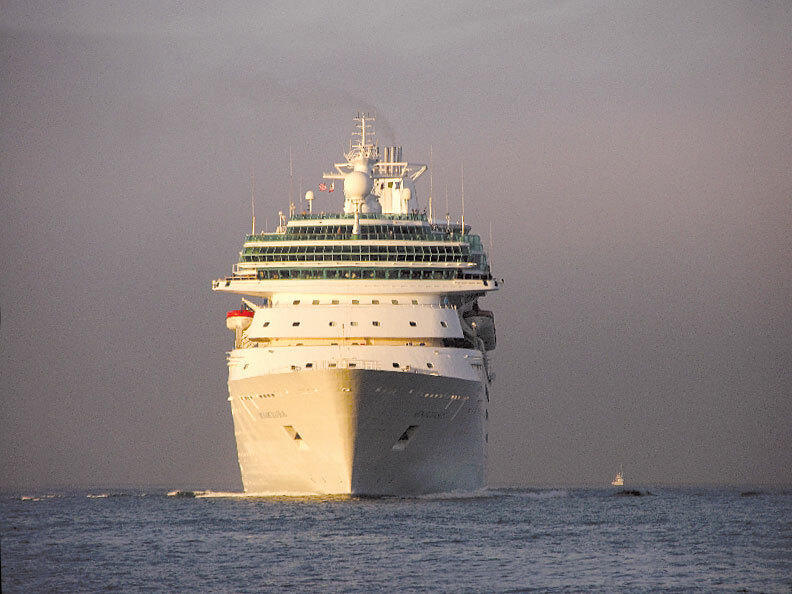 In 2010, more than 1 million passengers departed on cruise ships in California waters. The rule is expected to take effect approximately 30 days from the Feb. 9 signing date.